Our bio-certified olive oil from the new harvest of will be available from the end of November and delivered from December. Our oil is strictly limited and therefore we would be happy if you could place your order as soon as possible. Orders will be taken into account from the time they are received. Please provide us with your telephone or mobile number so that the mailing department can inform you about the delivery of the olive oil in good time. Only fill out if the billing address is different from the delivery address. High-quality gift box with gold and gloss finish, for a 250ml bottle of oil. Our statement is to confirm that we will deliver the ordered. Should your order exceed our capacities, we ask you to please understand that we may reserve the right to reduce your order. We will only deliver you top oil from our own production! We ask you to please understand that delivery only occurs if payment is made in advance. Delivery and packaging costs for home delivery in member states of the European Union amounts to a flat rate of € 12.00. Delivery and packaging costs for home delivery outside the European Union (EU) on request. Delivery is directly from Mallorca. Prices include the statutory VAT. 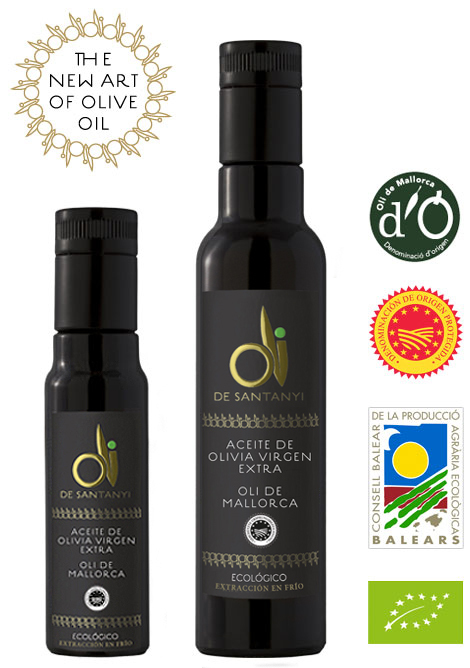 From time to time, we inform friends, interested parties and customers of our OLI DE SANTANY organic olive oil about activities and events surrounding our oil. Register here with a click and you will also receive this information. Yes, I would like to receive information from OLI DE SANTANYI.